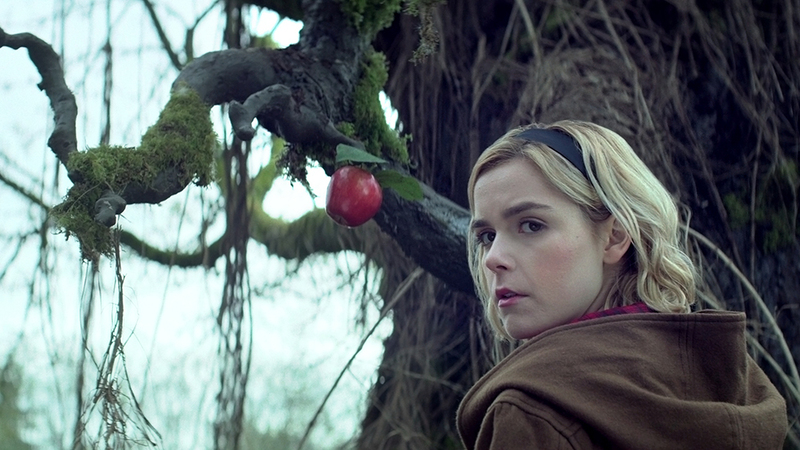 It’s been fun to watch Kieran Shipka grow up on TV, first on “Mad Men” and then on oddball things like “Flowers in the Attic.” Now she stars in her own series “The Chilling Adventures of Sabrina” (Netflix, streaming), another adaptation of the Archie character that is a departure from the 90s sitcom version with a talking cat starring Melissa Joan Hart. Based on the darker graphic novel, itsmore along the lines of the current “Riverdale” series, which makes sense since it’s from the same producers. More of an origin story, it concentrates on Sabrina choosing between witches and the human world on the occasion of her 16th birthday. Ross Lynch, Lucy Davis, Jaz Sinclair and Bronson Pinchot are part of the cast. Elsewhere online, the documentary “Shirkers” (Netflix, streaming) is about a cult movie made by a couple of teens in Singapore 25 years ago that was never completed because an American collaborator stole the footage. Director Sandi Tan picks up the case of the film that would have been years later. Amanda Peet, John Slattery, Diane Lane and Mary Ky Place star in the fourth installment of Matthew Weiner’s “The Romanoffs” (Amazon, streaming). A hit at the Berlin film festival, Aleksei German’s bio film “Dovlatov” (Netflix, streaming) is a Russian import about the 1970s Russian writer starring Milan Marić. Luis Callejo stars in the Spanish comedy import, “Jefe” (Netflix, streaming), about an odious boss who is changed when he begins to warm to the cleaning lady. Another new movie tonight is British romance “Been So Long” (Netflix, streaming), based on the stage musical. The animated Dracula series “Castlevania” (Netflix, streaming) returns for season two. A second season starts for “Midnight, Texas” (NBC, 9 p.m.) with a portal to hell found in a new hotel. Game 3 of the World Series moves to Los Angeles with Red Sox at Dodgers (Fox, 8 p.m.). Rebecca rethinks her career on “Crazy Ex-Girlfriend” (CW, 9 p.m.). A new “Real Time with Bill Maher” (HBO, 10 p.m.) hosts Stormy Daniels, Jonathan Haidt, Anthony Scaramucci, Max Boot and Betsy Woodruff. It’s Halloween on “Hawaii Five-0” (CBS, 9 p.m.). Warren and George search for Lt. Dante on “Z Nation” (Syfy, 9 p.m.). On “Blue Bloods” (CBS, 10 p.m.), a celebrated fertility doctor is the target of a murder. Back for more, the hour long version this time of “It’s the Great Pumpkin, Charlie Brown” (ABC, 8 p.m.). Sam tries to get Mohamad on board on “Van Helsing” (Syfy, 10 p.m.). “MacGyver” (CBS, 8 p.m.) goes to Mexico to rescue their boss from a cartel. Grandpa Vic visits “Raven’s Home” (Disney, 8 p.m.). On “Dynasty” (CW, 8 p.m.), Fallon is in over her head. As the real life Quantico examines this week’s mailed bombs, the FBI on “Blindspot” (NBC, 8 p.m.), according to its episode description, “faces an explosive threat. “Channel Zero” (Syfy, 11 p.m.) returns for a fourth season. It’s all about moonshine on Turner Classic Movies tonight with “White Lightning” (8 p.m.), “The Moonshine War” (10 p.m.) and “The Devil’s Eight” (midnight). Then comes horror films with fingers: “The Hand” (2 a.m.) and “The Beast with Five Fingers” (4 a.m.). There are literary adaptations all day on TCM with “Dodsworth” (6 a.m.), “A Man for All Seasons” (8 a.m.), “Anna Karenina” (10:45 a.m.) and “Anne of Green Gables” (12:45 p.m.), and a couple with a Katharine Hepburn lead, “Little Women” (2:15 p.m.) and “Quality Street” (4:30 p.m.), followed by the documentary “Katharine Hepburn: All About Me” (6:30 p.m.). Basketball includes Golden State at New York (NBA, 7:30 p.m.) and Washington at Sacramento (NBA, 10 p.m.). Hockey has Winnipeg at Detroit (NHL, 7:30 p.m.). College football includes Louisiana Tech at Florida Atlantic (CBS Sports, 6:30 p.m.), Miami at Boston College (ESPN, 7 p.m.), Indiana at Minnesota (Fox Sports 1, 8 p.m.), Wyoming at Colorado State (CBS Sports, 10 p.m.) and Utah at UCLA (ESPN, 10:30 p.m.). College hockey starts up with Minnesota-Duluth at Notre Dame (NBC Sports, 7 p.m.). It’s Princeton at Yale (ESPNU, 6 p.m.) and Kansas State at Iowa State (ESPNU, 8 p.m.) in women’s college basketball. Women’s college soccer has Pepperdine at Gonzaga (ESPNU, 10 p.m.). Kelly Ripa and Ryan Seacrest: Robin right, Sara Gilbert, Maddie Poppe, Tom Sardine. The View: Tiffany Haddish. The Talk: Salt-N-Pepa, All-4-One, Rob Base. Steve Harvey: A’Shawn Robinson. Ellen DeGeneres: Kris Jenner, Ciara. Wendy Williams: Carson Kressley, Thom Filicia. The Real: Sasha Banks. Stephen Colbert: Dr. Phil McGraw, Kayli Carter, Janelle Monae. Jimmy Kimmel: Dakota Johnson, Ike Barinholtz, Tom Morello with Portugal the Man (rerun). Jimmy Fallon: Whoopi Goldberg, Nikki & Brie Bella, Joshua Jay. Seth Meyers: Pete Davidson, Mary Lynn Rajskub, Zainab Johnson, Ben Sesar (rerun). James Corden: Tiffany Haddish, Jay Hernandez, Tori Kelly (rerun). Carson Daly: Rhys Darby, Drab Majesty, Rhett & Link (rerun).